Facebook on Thursday launched an initiative it calls the Open Compute Project, an effort to share the specs and designs of the custom servers in its data center in Prineville, Ore. In other words, Facebook is going to open source its hardware designs just like the software industry largely has. 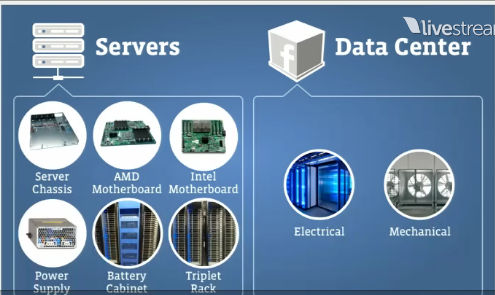 In many respects, Facebook is open sourcing its data center and server designs. Jonathan Heiliger, vice president of technical operations, said the Open Compute Project is a way of giving back. It’s also a way to get vendors with more scale to incorporate Facebook’s designs to meet its needs with cheaper systems. The big question is what tech vendors—all pitching their own designs—will make of Facebook’s effort. The move to rid servers of vanity plastic would mean no branding. Facebook went completely barebones. That works for efficient computing, but leaves little for vendors to differentiate with. The figures, however, lean toward Facebook’s favor. While the fallout remains to be seen, the fact Facebook is detailing all of its specifications for servers and its data center—including the CAD drawings—is going to be disruptive. Facebook’s PUE rating, the power used for data center compute, came in at 1.07. The industry average is 1.5 PUE and Facebook’s leased data center is 1.4 to 1.6 PUE. You can build servers and design them or get the products that the mass manufacturers put out. A lot of the stuff put out wasn’t in line with what we needed. We’re not the only ones that need the hardware we’re building out. 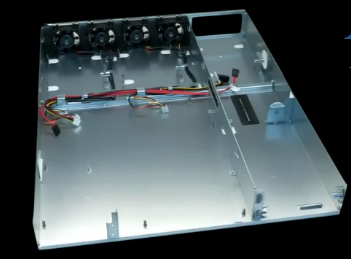 On the server designs, Facebook went lightweight and ditched any screws and “vanity plastic.” The chassis is simple and has 22 percent fewer materials. 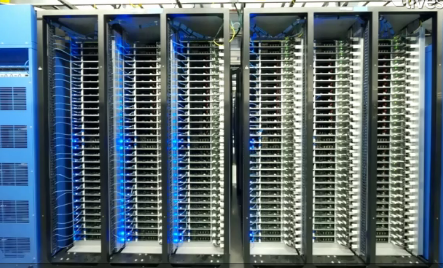 Indeed, Facebook’s servers weigh 6 pounds less. Facebook also went with custom Intel and AMD motherboard. Expansion slots were ditched. Power supplies were simplified and included with a backup. Power supply efficiency exceeds 94 percent. Racks are in triplets for easy deployment and swaps. Facebook aimed to cut the energy loss from the grid to the motherboard. There’s a 480 volt electrical system through the data center and 277 volts go directly to each server. Facebook’s data center has no air conditioning system. It is cooled with outside air. Walls eliminate water particles to only get the cool air. There is no duct work in the data center. 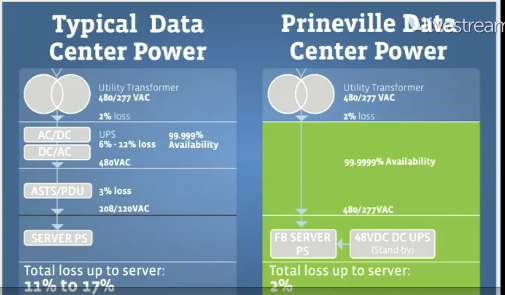 Facebook uses localized uninteruptable power supplies serving six racks of servers. The upshot here is that many IT buyers will look at Facebook designs and incorporate them into what they do. It’s highly likely that technology vendors will have to respond. Facebook’s move will change the intellectual property dynamics in the hardware industry. How many IT buyers and vendors are already working to solve the same problems Facebook has? Smaller companies such as Zynga will simply adopt Facebook designs. 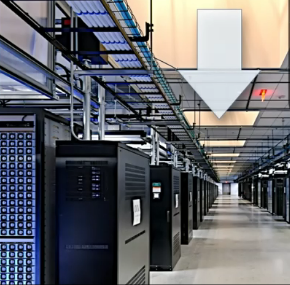 IT buyers may start asking for Facebook’s data center approach. Dell is already offering systems based on Facebook’s designs. Existing hardware vendors may see more commodity pricing. Open standards are going to make it more difficult for hardware giants pitching proprietary stacks. Even more valuable is Facebook’s decision to publish its server, rack and power specifications as part of the “Open Compute Project”, an initiative they are promoting to make these specifications available to users and vendors in the hopes of creating an ecosystem around these stripped down cost optimized servers and associated infrastructure. Facebook claims it is to encourage the development of new web companies by making it easier for them to build world-class infrastructure. Even if their true motivations are also weighted by a less altruistic goal of further lowering their costs by creating a community of multiple competing suppliers, Facebook deserves credit for sharing their IP with a wider and in some cases potentially competitive world. Selamat kepada CIMB SECURITIES INDONESIA yang telah memilih dan menggunakan PRTG PAESSLER selama ini. Selamat kepada LINFOX yang telah memilih solusi SMS GATEWAY dengan menggunakan OZEKI NG. OZEKI NG, sebuah produk unggulan SMS Gateway yang didisain khusus untuk menjawab kebutuhan Anda, terkait dengan kemudahan setup, integrasi dengan aplikasi yang telah ada. Dengan menggunakan OZEKI NG, aplikasi dapat dioptimalkan dan diintegrasikan dengan SMS gateway, sehingga konsumen atau pengguna dapat mengakses sistem dengan menggunakan media SMS. Silahkan hubungi kami untuk kebutuhan SMS Gateway perusahaan Anda. Humas UNJ, 29/3/2011. Senin, 29 Maret 2011 bertempat di Aula Perpustakaan UNJ, Pembantu Rektor I mengadakan Seminar dengan tema “Pengembangan dan Implementasi Kurikulum”. Seminar ini dihadiri oleh PD I, Kajur dan Kaprodi di lingkungan UNJ. Hadir sebagai Pembicara pertama, PR I, Prof. Dr. Zainal Rafli, M.Pd. Dalam paparannya beliau menjelaskan, bahwa pengembangan kurikulum adalah sebagai dasar pemikiran sejarah dan perkembangan UNJ sebagai LPTK. Dijelaskan pula oleh beliau, perjalanan kurikulum UNJ yang pertama adalah kurikulum LPTK tahun 70-90, meliputi Mata Kuliah Dasar Umum (MKDU), Mata Kuliah Dasar Kependidikan (MKDK), Mata Kuliah Bidang Studi (MKBS), Mata Kuliah Proses Belajar Mengajar (MKPBM) dan MKCF (sesuai kebutuhan institusi). Pada Kurikulum UNJ era 2000 hingga kini (Kepmendiknas 232/U/00 dan 054/U/02 yang meliputi Mata kuliah Pengembangan Kepribadian (MPK), Mata Kuliah Keilmuan (MKK), Mata Kuliah Keahlian Berkarya (MKB), Mata Kuliah Berkehidupan Bermasyarakat (MKBB). Dr. Bambang Heru sebagai pembicara kedua, memaparkan Grand Design Pengembangan Teknologi Informasi. Grand Design Pengembangan Teknologi Informasi dan komunikasi UNJ Tahun 2011-2015 disusun untuk memberikan pedoman dalam pembangunan sistem TIK di UNJ. 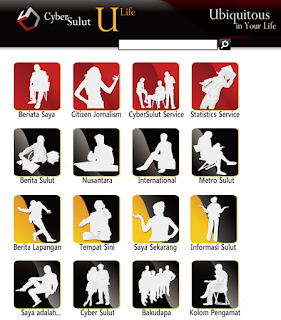 Rancang bangun ini disusun untuk mencapai suatu tujuan, antara lain mencapai UNJ sebagai excellent smart campus menuju Cyber University dalam lima tahun ke depan, serta peningkatan kualitas manajemen organisasi melalui penerapan manajemen administrasi berbasis TIK yang inovatif sesuai dengan Good University Governance (GUG) yang diharapkan. Believe or not that you can create and efficient wifi network for your small office and home office (SOHO). For doing this you only need several Linksys WRT54GL to cover every spot to get maximum signal strength without meshed up by your network cable. Suppose that you have a client or group of client that >50m away from main accesspoint (WRT54GL) with several obstacle that you believe reduce your main accespoint signal strength reach that clients spot. Having this case, the conventional idea is laying network cable from main accespoint to the spot and activate another wireless accespoint. don't be mistaken, this proposal is nothing wrong with it. The only is, we just want to simplify the work, other word of lazy, to avoid get sweat and perform an act as wireless hacker guy. To achieve the same result as conventional way without cable, we will use dd-wrt linksys firmware facility called WDS. on the #1 WRT54GL (main accespoint), go to menu: Wireless>WDS. Once you get there, please attention to WDS settings and you will see Ten empty slot. Choose the first empty slot and change the 'Disable' to 'LAN' then fill the six MAC field that initially contain with '00' to your #2 WRT54GL wireless MAC address (to obtain the #2 wireless MAC, see #1 picture with red rectangle). Leave the rest of settings and to finish the setting for #1 WRT54GL press apply settings button at the botom. Now go to #2 Wrt54GL Setup>Basic Setup, that already flashed with dd-wrt firmware for sure, then disable DHCP server to avoid 2 DHCP server running on your network and change the routerIP to the different IP than the #1 WRT54GL (in my case I choose 192.168.1.2). Now you safe to connecting #2 WRT54GL to the Main Accespoint! to set WDS for this #2WRT54GL, please do the same way as the step No. 2 to fill #1 WRT54GL Wireless MAC address to WDS settings at #2 WRT54GL. Finally we're on the final step to complete the setting at #2 WRT54GL by clone the basic wireless settings as #1 WRT54GL. The easiest way is to just go to Wireless>Basic Settings and change the SSID and the channel then leave the rest. To see the result, just go to your main router (in my case I browse to http://192.168.1.1) and see the system info. You'll get the WDS Node has active. At this point, you already done the WDS setup and running. So you can test the achievement, on the spot where previously has weak signal, by monitor the wireless on your laptop wifi manager. Additionally, since WRT54GL has built-in 4 port switch, you can expand your SOHO network using network cable via the built-in switch. Salah satu hal yang paling menarik dengan menggunakan CMS Zeroboard adalah kemudahan membuat website komunitas. Kami telah mengembangkan beberapa website komunitas, seperti www.gkibektim.org dan www.cybersulut.com. Dengan menggunakan CMS ini, maka kami sangat mudah membuat website yang dapat diakses juga secara online, baik dengan menggunakan PC atau pun smart phone.